One week into the Whole30 and I am feeling pretty good! I managed to stay compliant despite a business trip on Tuesday, a happy hour on Friday and a 56 mile bike ride on Saturday. Success! This week I made a variety of different Whole 30 approved deliciousness, but this one rose to the top! 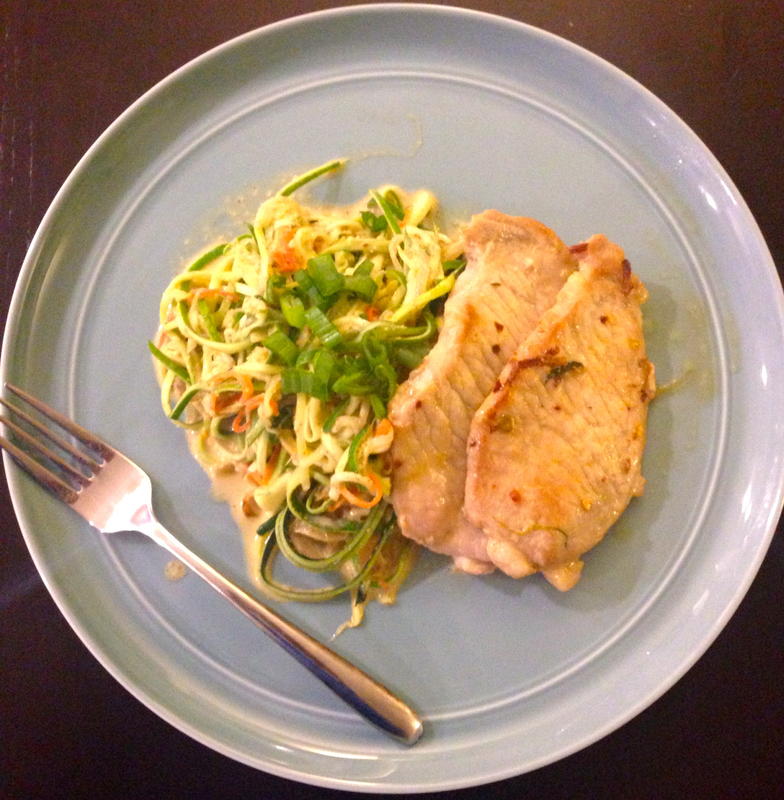 It is a heaping portion of zucchini noodles (zoodles), with a healthy dose of super duper delicious paleo “peanut” sauce, accompanied by ginger tangerine pork cutlets. So good! 1. Eat a little bit, a lot: When using Gus, I typically eat one about every hour or so when either running or on the bike. I tried to follow this same approach yesterday by nibbling at some nuts and a Lara Bar at about the same frequency. I never once felt hungry or even close to the awful “bonk.” I also made sure that I drank a lot of water (which you should do regardless of whether not you are doing a ride Whole30 style or not). At every stop light I pulled out my bottle, and also on any long stretches where there was time to safely take a sip. The only side effect of this is having to pee a fair amount, so make sure you have bathroom stops planned! 2. Make sure you are getting your electrolytes: Gatorade or other sports drinks are a go-to for most athletes in order to maintain electrolyte levels, but there are other ways. Salty foods (like nuts) are a great start to maintain sodium levels. At the stops yesterday, I threw in a banana to restore potassium, and some coconut water which I have read, is the best natural source of electrolytes, packed with potassium, calcium and sodium. I would take it on my bike like I would Gatorade, but I am not a fan of warm coconut water, so until I grow an affinity for that, I will just get it cold, at stopping points. 2. Afterwards, eat!! : As soon as the workout is done you should try to eat a full meal, preferably one that has a fair amount of protein and rather dense in carbohydrates (ahem, sweet potatoes). I didn’t have sweet potatoes yesterday but I did have chicken and a huge helping of roasted vegetables (squash, onion, pepper, broccoli etc) and that seemed to do the trick. 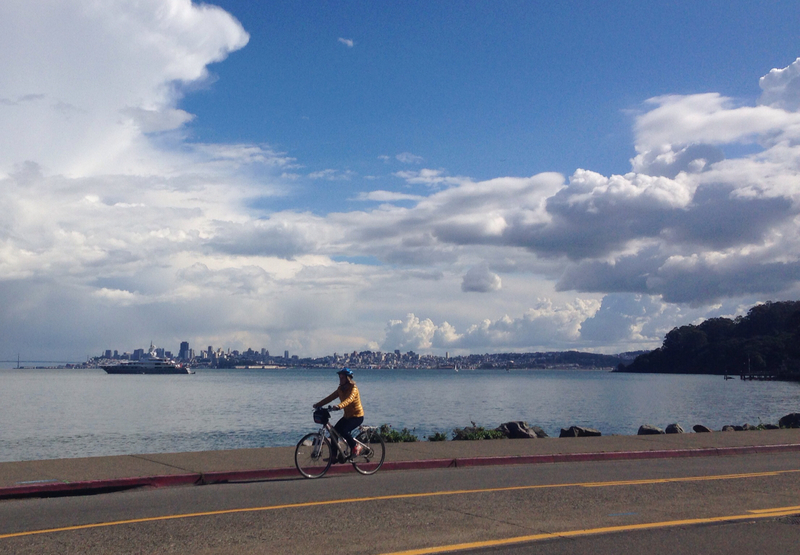 Here’s a couple shots from yesterday’s ride. 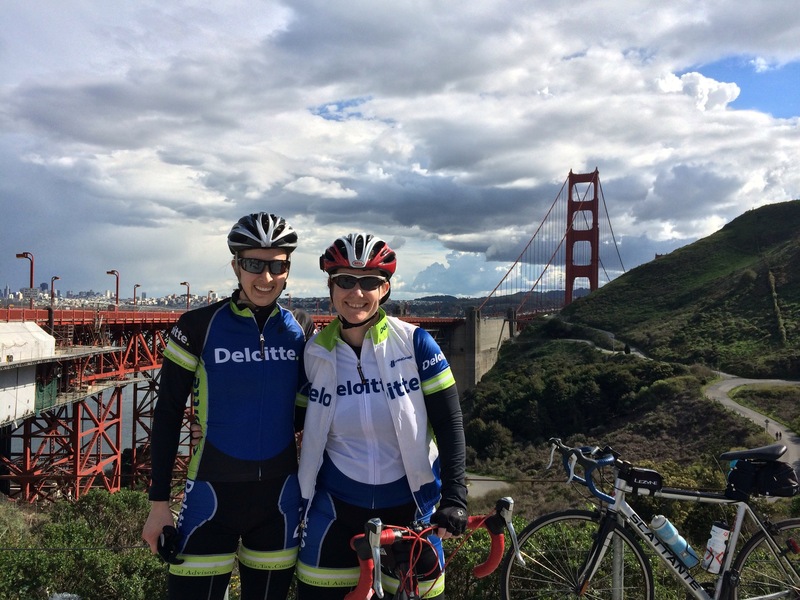 I am definitely loving the beautiful riding here in Northern California! Now to the recipe for this week… I knew that it was going to be good when I dreamt up the combo, but this exceeded even my expectations. The paleo peanut sauce, which I have discussed before, is so freaking good, I am pretty sure it would make anything taste amazing! I hope you enjoy this as much as I did! 1. Start by placing the Pork Cutlets in a quick marinade of the coconut animos, ginger, tangerine, salt and pepper. Set aside until step #7. 2. For the Zucchini Noodles, spiralize, julienne or slice the zucchini and carrot. Use whatever tool you have on hand, or just a knife. I have this really crappy vegetable julienne peeler that I used for this one. I need to get a big girl spiralizer, but I am overwhelmed by the many options. Let me know if you have any recommendations! 3. Thinly slice the onion and finely chop the garlic and then add to a medium sized pan where you have heated the coconut oil over medium-high heat. Sautée until translucent, lower the heat to medium, and add the zucchini and carrot. Cook just until the zucchini is heated through. 4. Remove from the stove and set aside while you prep the “Peanut” Sauce in step #5. 5. Place all the ingredients for the sauce in a food processor or blender and pulse until combined. Depending on the consistency of your almond butter and how juicy your lime/tangerine are, you may want to add just a bit of water to thin it out to the consistency of peanut sauce. 6. Drain any excess liquid from the zucchini noodles and stir in the peanut sauce. Set aside while you cook up the Pork Cutlets in step #7. 7. Heat 1 tbs of coconut oil in a medium to large skillet over medium-high heat. Once heated, add the pork. Let cook for 3-5 minutes per side, depending on the thickness of your pork. Mine were quite thin and only took 3 minutes per side. Try to get a nice brown sear (mine could have been better), but don’t overcook it, nobody likes dry pork. 8. Plate the noodles and pork and garnish with chopped green onion. Enjoy!! Tags: 30 - 45 minutes, Gluten Free, Paleo, Pork, Under $5 / serving, Whole 30. Bookmark the permalink.